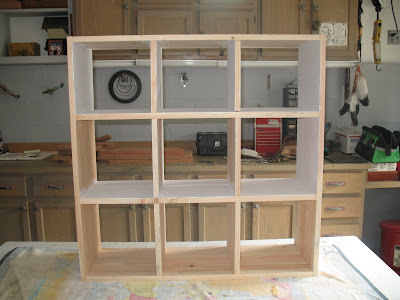 Last weekend my father finished building my sweater cubby (one of the many projects I've had him working on this month) for my wee walk-in closet. 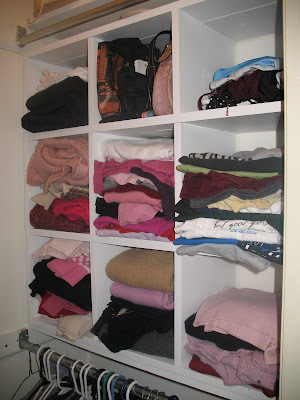 Since it has double rods on both sides, and I only use three of them, there was a great space available storage. It was previously occupied by mountains of sweaters, all threatening to topple over, desperate for some shelving to keep them organized. My next project in here is going to be a new flip flop storage system (basket, perhaps?) 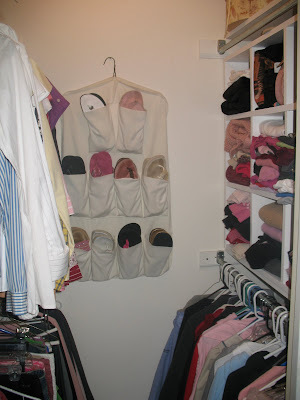 to get that shoe organizer off the back wall, and I want to paint the closet walls pale pink! Then all the trim will go a fresh coat of white. Maybe I'll get a new light fixture, too, the one in here looks like an old jar with a brass lid... ick! What do you think?